Who’s Afraid of Rachel Roberts? “Don’t you want to be happy?” The line is spoken by Richard Harris’ Frank Machin in his first scene with Rachel Roberts in Lindsay Anderson’s 1963 film “This Sporting Life.” It haunts the ninety minutes of Dave Ainsworth’s and Helen Griffin’s ninety-minute bio-drama, which shows wealth, celebrity, professional acclamation as nothing in love’s absence. This interpretation of the life is played out on its final day- Rachel Roberts was fifty-three at the time of her death. The shining sun in November has her yearning for a Welsh rain. Wales is a comforting presence; an adored shadowy father, albeit a powerful social code- “Mustn’t show any pride. Go to hell for that in Wales.” The most jarring and intriguing part of the psychological make-up is kept until the end, the rejection at birth by the mother. “It’s nothing to you what people think” is a line of hers from David Storey’s script for “This Sporting Life.” Not so in life; the jump from social extroversion to exhibitionism is marked early on. In 1948 she walks naked along Aberystwyth’s promenade. At parties of Hollywood’s A-listers she opts for comic performance. As a Welsh corgi she bites Robert Mitchum’s leg- he does not mind that much. A real dog features at another party. The irony is that the life as portrayed here is defined by a yearning for a marriage, and a love, that work. They don’t. The language is richly foul. Her behaviour drives away a posse of outraged matrons with their lips “pursed as if they’ve got lemons up their arses.” This picture of estranged extroversion is filled, accurately, with streams of redundant expletives. As always they are desperation’s true indicator. Aesthetically bio-drama has two main challenges. The first is veracity. Television productions have a habit of following the style, as well as the ethics, of the Sunday Sport. If the facts aren’t there, make them up. “The events portrayed and the language used” say the authors “are based on fact.” It sounds true. A drawback of the genre is its inherent lack of momentum. There are a couple of writerly tricks, not deployed here, to offset this. Bio-drama has become a mainstay at Edinburgh for obvious reasons of simplicity and economy. The pieces there come in at sixty to seventy minutes. 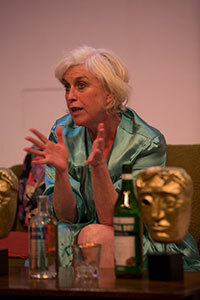 Helen Griffin’s performance holds the play but audiences would be better served with a fifth shaved off. “Who’s Afraid of Rachel Roberts?” is a kind of companion piece to Gwynne Edwards popular “Burton”. The Burtons even feature in the play. At a film premiere the paparazzi turn their cameras from the stars, Roberts and Rex Harrison, to the greater attraction of the Burtons. There is the same rancid disillusion, the same volatile marriage, the same enslavement to alcohol. But the artistic heritage differs. Firstly, Rachel Roberts kept greater faith with the theatre. That enabled her to collect the Best Actress award for E A Whitehead’s “Alpha Beta” in 1971. Dave Ainsworth and Helen Griffin make specific reference to the film throughout. A pair of shoes, owner unknown, mirrors the shoes of dead husband Eric lovingly polished by her character, widowed Mrs Hammond, in the film. The script cites the view of Rex Harrison: “a grubby role in a squalid film.” That is not so. “This Sporting Life” is still possessed of colossal force. The sporting scenes, with their hand-held camera, are right up there alongside “Raging Bull”. Dennis Coop’s photography, Peter Taylor’s editing and Roberto Gerhard’s music are exceptional. The scenes between the two main characters make Ingmar Bergman look like a Richard Curtis romcom. Rachel Roberts’ presence has a searing intensity and vulnerability. It is the art that matters. Many of the play’s touring venues have screens. Biography is one thing; audiences for the play should also have the opportunity to see the art.